Major League Baseball in the USA continues to study, modernise and apply technological advancements to their league, leading to its lead up to its 2014 national “spring training” friendlies, which commence on the February 25th. Yesterday, MLB preliminarily approved padded hats specifically aimed at protecting the head area of pitchers, who are most at risk of being hit with a high-velocity batted ball because of their close proximity (60 ft. 6 inches /18.44 meters) to the batsman and the limited reaction time afforded to them. On January 16th, MLB approved, starting with their 2014 season, the expansion of instant replay to aid umpires and offer the teams a method to challenge a call; a few days later, MLB strengthened their security policy, mandating its 30 clubs to add metal detectors and security screenings at their stadium entries by 2015. During this initial phase of new hat approval, use of the newly approved safety device will be optional. "MLB is committed to working with manufacturers to develop products that offer maximum protection to our players, and we're not stopping at all," MLB executive VP for labor relations said in a TV interview. The approval follows an MLB-commissioned study that suggested the average speed of a batted ball with the trajectory needed to strike a pitcher was 83 mph/ 134 kmh. 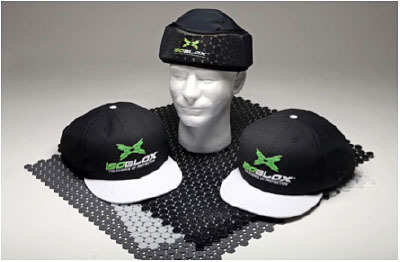 4Licensing, designers of the safety lid, report that their hat can withstand force from an frontal impact up to 90 mph / 144 khm, exceeding the threshold of the MLB study. The safety hats are noticeably thicker, especially near the most vulnerable areas around the temples, which adds on a safety layer of 1 inch / 2.5 cm. "The process that Major League Baseball took [to approve 4Licesning’s safety hat] was very careful and deliberate. This wasn't something they were rushing to do. They were prudent. They understood the importance of protective gear for a pitcher…it was very valuable testing." It is not known, however, how the safety hats will be perceived by the players. Baseball’s current highest paid player in history, Clayton Kershaw of the Los Angeles Dodgers, is optimistic about the application of the safety hat and technology in the sport of baseball. "I've actually tried one of those on," said Kershaw. "I've thrown with it. You don't look very cool. I'll be honest. You don't look very cool out there. But technology is unbelievable and it really doesn't feel that much different once you get used to it. Obviously it would be a change. We wouldn't look the same as everybody else, but if you're that one guy who gets hit what seems like every year, there's that chance out there. I'm definitely not opposed to it. I think it'd take a lot of getting used to. I think it's a great thing and a step in the right direction, for sure."